Obituary – Bisagno, Rev. 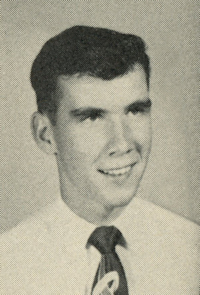 John Roger « Perry High School Alumni Association, Inc.
﻿Football 47-48, Basketball 48-51, Band 49-51, Student Director 50-51, F. F. A. 47-48, F. F. A. Watchdog 47-48, Baseball 49-50, Junior Play 49-50, Class Assembly 47-50. Dr. John Roger Bisagno, also lovingly known to many as Johnny Bisagno, Brother John, Dad, Pops and Poppy was born on a spring day April 5, 1934 in Augusta, Kansas to John Joseph “JJ” Bisagno and Claire Reese (Balthrop) Bisagno. He moved to Perry, OK as a teenager, attended and graduated from Perry High School. He learned the meaning of hard work helping his father at the Bisagno Hatchery in Perry. John loved music from an early age. Playing the trumpet came naturally to him and, as a teenager, played with some very notable musicians of his day and even became the band leader of several jazz, dance and Dixieland bands. He attended Oklahoma State University for a short time. But it was a hot summer night in Davis, OK while attending Falls Creek Youth Camp that Brother John’s life changed forever. On the night of August 1, 1952 Brother John made 2 life changing decisions: The first was receiving the love and forgiveness of Jesus Christ in his heart; and the second decision was dedicating the rest of his life to full-time Christian ministry. He left OSU and enrolled at Oklahoma Baptist University. It was while attending OBU he met the love of his life, his gorgeous beauty queen, Uldine Beck. It was love at first sight for both of them. On their first date he asked Uldine, “So where do you think you’d like to spend your honeymoon?” to which she immediately replied, “Anywhere with you!” They were married 11 months later on August 27, 1954. They had their first child, a daughter, Melodye Jan “Ginger” in December 1955. In 1959, after leading the music at many revivals all around the country and around the world with evangelist, Hyman Appelman; Brother John felt the call to not just lead music but also to preach. During that time, he and Uldine had two sons, Timothy John “Tim” (1962) and Anthony Joseph “Tony” (1963). Brother John continued to lead revivals as a traveling evangelist until 1965 when he became pastor at First Southern Baptist Church of Del City, OK.
On February 15th of 1970, John Bisagno preached his first Sunday sermon as pastor of Houston’s First Baptist Church. His passion for the young people of Houston was evident in 1971 when he hosted SPIRENO Revivals (which stood for “Spiritual Revolution Now”) led by Richard Hogue at FBC downtown. To say Brother John was a visionary is an understatement! He was never afraid to take the lead in something that had never been done before. In 1977 he moved Houston’s First Baptist Church from downtown to its current location at the corner of 610 and I-10. He was the driving force behind 3 Christian schools in Houston: re-establishing Northwest Academy and founding Houston Christian High School and First Baptist Academy. He pastored HFBC for 30 years, giving birth to numerous mission churches and ministries. During his leadership there, the church grew from hundreds in attendance to over 22,000 when he retired in the year 2000. Countless lives have been reached with the Gospel of Jesus Christ because of Brother John’s belief in God’s power to move mountains. Brother John was preceded in death by his parents, JJ and Claire Reese Bisagno; his sister, Betty Harrell; and his loving wife of 63 years, Uldine Beck Bisagno. He is survived by… his 3 children: daughter, Ginger Dodd and her husband Dr. Curt Dodd of Fremont, NE. His son Tim Bisagno and wife Edye of Franklin, TN. His son Tony Bisagno and wife Dottie of Tyler, TX. His 8 grandchildren: Jonathan Dodd and wife Catherine of Papillion, NE; Zachary Dodd and wife Carlie in Ulaanbataar, Mongolia; Britni Dodd-Meacham and her husband Kristopher Meacham in Kobayashi, Japan; River Bisagno and Rocco Bisagno of Franklin, TN; and AJ Bisagno, Harper Bisagno and Oliver Bisagno of Tyler, TX. And his 7 Great-Grandchildren: Charlotte, TJ and Shepherd Dodd of Papillion, NE; and Banner, Vivi, Mercy and Luca Dodd in Ulaanbataar, Mongolia… Oh and his precious dog, Andi, now in Papillion, NE. Brother John was passionate to the very end about seeing another huge spiritual revival and to see the body of Christ wake up and rise up! The trumpet player from Perry became a horn in the hands of the Lord, declaring God’s truth to three generations of people looking for an answer. 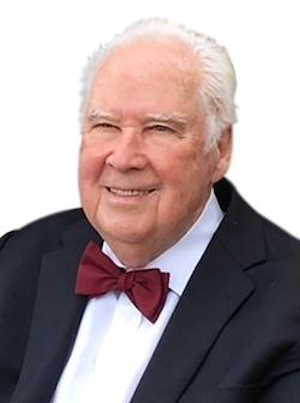 His passion and legacy of love for Jesus and others continues on through his children and their ministries, his grandchildren and their ministries, through his great grandchildren, through Houston’s First Baptist Church and through the many many lives he has reached by simply saying “yes” to Jesus.